Kerry Park has been on my list to do once I learned I was going to graduate school in Seattle. 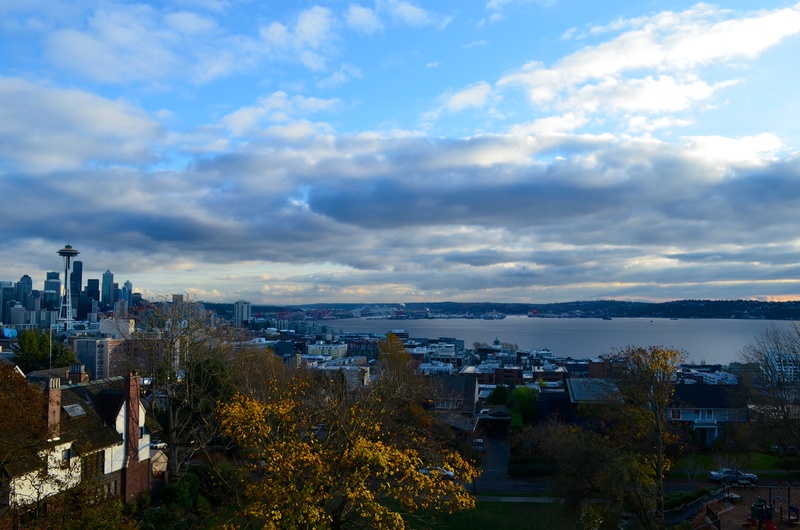 I had seen photos taken from this picturesque location and was stunned by the great viewpoint of downtown Seattle. 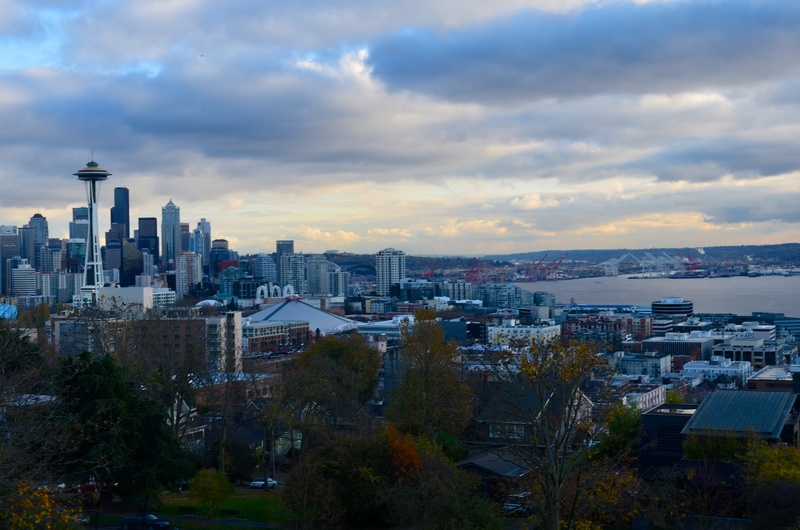 What brought me to Kerry Park for the first time was not actually my list, but rather another assignment. I am currently in a group where we are required to make a video, so I decided to head to Kerry Park to shoot some b-roll and watch the sunset over the sound. My journey actually starts at a beer store in Wallingford called Bottleworks. At around 1 PM Bottleworks tweeted that they had a beer I was looking for in stock, Stone Mint Chocolate Imperial Stout, so I quickly hopped on my bike to go grab a few bottles before they were all gone. Bottleworks is a great beer store, often getting rare beer but always having a great collection of craft beer. The growler bar in the back has several beers on tap, but I had never actually sat down in the place and enjoyed a beer. When I got there, 2 guys were unloading the massive shipment of beer in the middle of the store and chatting. I entered and started to look around before talking to one of the guys about what I was looking for. I told him, and he told me that hadn’t even unboxed it yet but he would certainly grab me a few bottles. I also asked if he had any more Pliny the Elder on tap, a Californian beer ranked #6 currently on BeerAdvocate. He said yes, to his surprise they hadn’t sold out yet, so I sat down and enjoyed a pint of this fine beer. Pliny is often sought after by craft beer aficionados and I only had the privilege to enjoy this Imperial IPA once before, so I couldn’t pass up this opportunity to have it on tap. 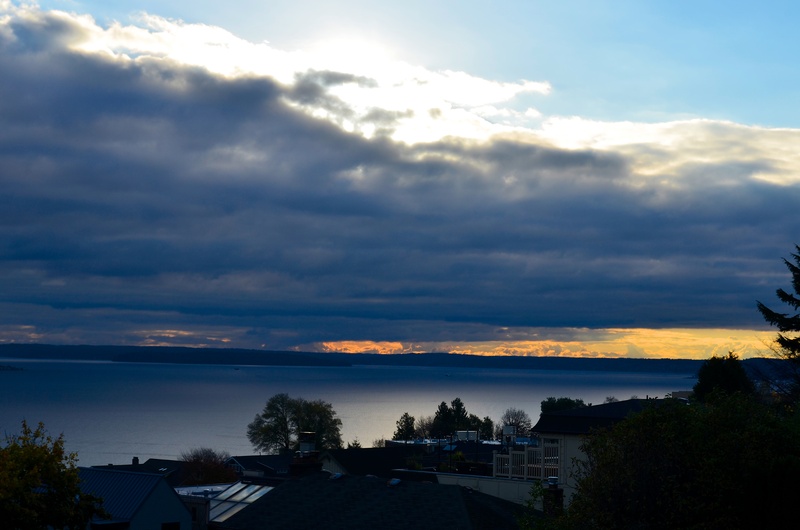 As I was sitting in the store, I decided to look up the sunset times in Seattle, because it was a rare blue-sky day. 4:33- Quite early, but winter is coming. It was almost 2 o’clock and I was still drinking my beer, so I decided to finish the tasty brew and bike home. I wanted to make sure I was at Kerry Park with plenty of time to claim a spot and set up my camera, so I caught a 32 bus over to Queen Anne that would arrive at 3:30. To get to Kerry Park, I recommend you get off at the 3rd and Mercer Stop. 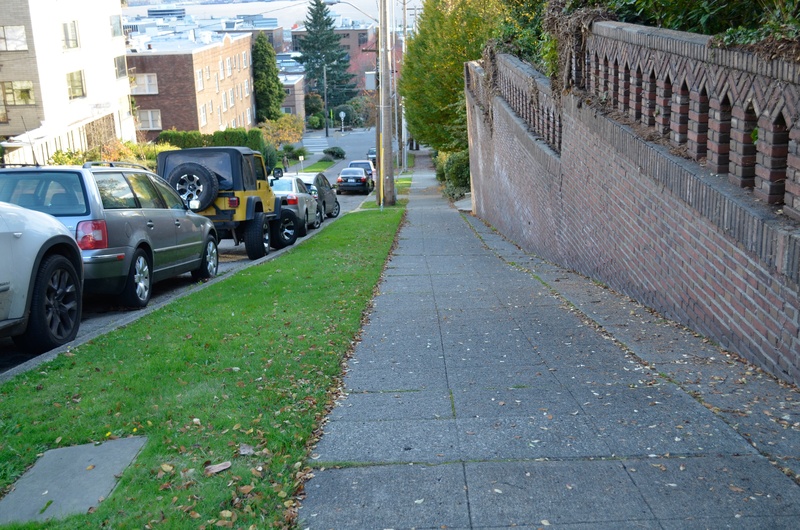 It is a short, but intense, 5-block walk up an extremely steep hill before you reach the small cliff that is Kerry Park. Other than the view, there really isn’t much to do at he park, but it is more than enough to keep you in awe. A couple of benches, random statue, and a playground make up this park perched on the hill. But honestly, none of it matters other than the view of downtown. 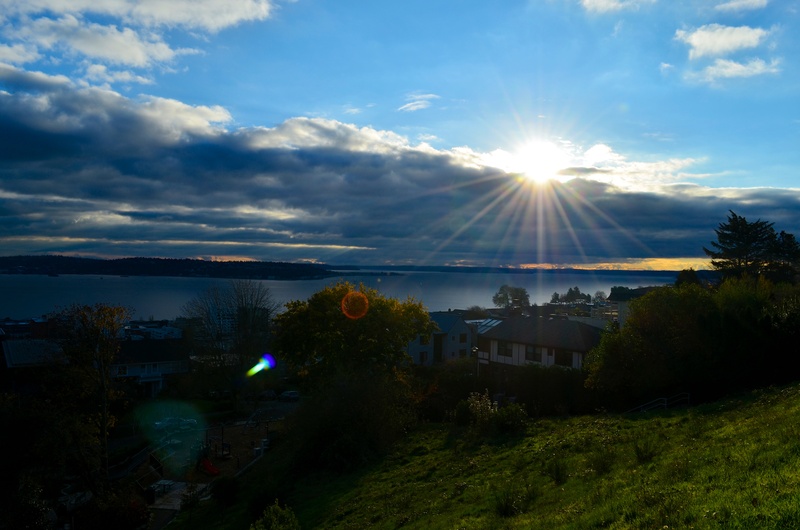 With the city on your left and Puget Sound on your right, this view does a great job of capturing what makes Seattle, Seattle. On a clear day you can even see Mt. Rainier behind the city, which glowed a nice pink as the sun went down. 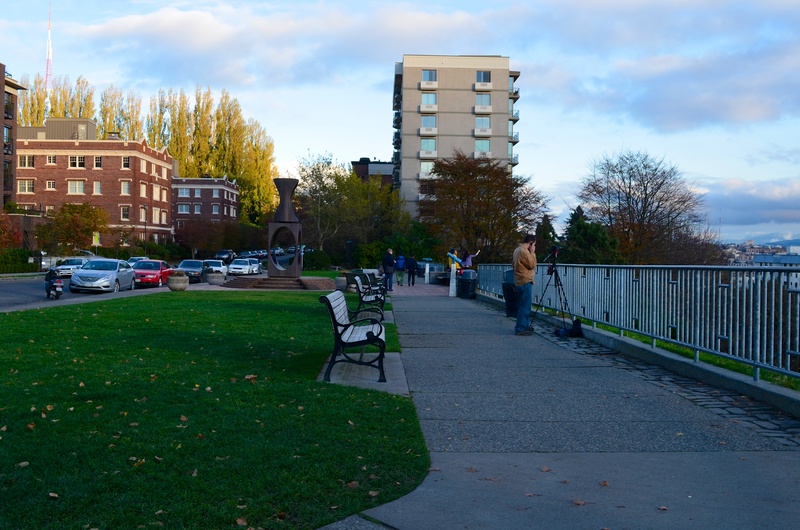 After snapping a few pictures and walking around, I set up my camera and starting recording the time lapse. I had never done a time lapse before, but knew I needed to film with a steady camera for a long period of time. There are other methods, but I decided without proper research to film then speed up, rather than take a picture every 5 seconds using a special device. I ended up filming for about an hour straight, capturing the sun going down on the city and the beginning of the lights coming on. I was the lone hold out, arriving well before everyone else and being on of the last to leave. Once the sun went down, the temperature dropped quickly and my battery died before I was able to capture a night shot, but I had got what I needed. Or at least I hoped. As my camera and phone simultaneously died, I took my frigid bones back down the steep hill and to the bus stop. Luckily the bus came a minute after I got to the stop, so I could quickly warm up and get home. It took about 30 minutes each way via bus, but driving will get you from the U-District to Kerry Park in 10 to 15 minutes. 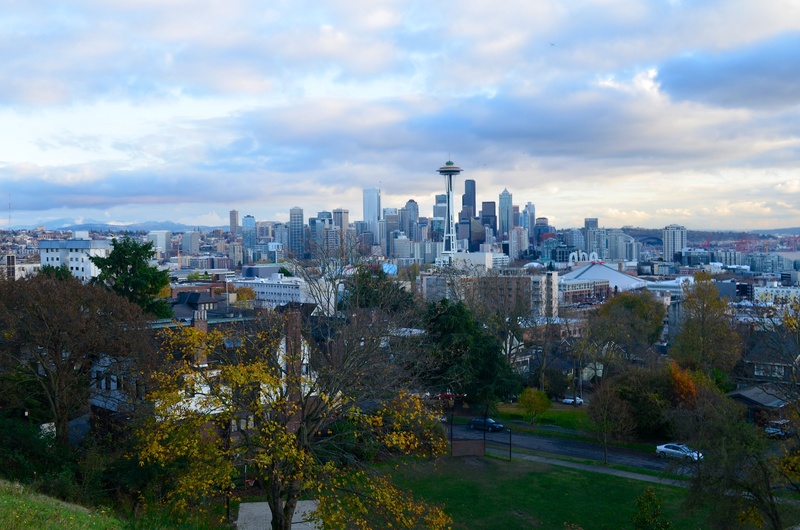 Overall, Kerry Park is a FANTASTIC free destination in Seattle that is awesome for every age. It has a playground for kids and view that doesn’t get old for everyone else. I recommend you drive, but a bus gets you extremely close. This is a place I will definitely be back to visit when it starts to warm up and skies are clearer. Definitely not the first word that someone on a graduate student budget thinks. But with the recent events in my home state of New Jersey, donating was something that I not only wanted to do, but I felt obligated to do. Over the past week I have had friends send me pictures and tell stories of the destruction. I have friends all over the state, thanks to Rutgers, and it is hard to find anyone unaffected. I have friends who have beach houses lost, cars destroyed, and ongoing loss of power. It seems that now more than ever, the great state of New Jersey needs my help.Donating was easy. I have been planning on donating for a while but never seemed to actually pick up the card and do it. Today, as I was in Walgreen’s, I was prompted by the credit card machine to donate money to the Red Cross for hurricane Sandy relief. I’m assuming that Walgreen’s does not keep any percentage of my donation, but that’s not the point. The point is that people out there need help. It is easy to say that others will donate or that the states will find money somewhere, but the truth is that every dollar from every person counts. Red Cross is a great organization and I have faith that my money will be put to good use. If you want to also donate, I urge you to give what you can at www.redcross.org. Every dollar counts. For those not looking to donate, consider buying some products where proceeds go to hurricane relief, such as Jetty’s Hurricane Sandy Relief T-Shirt. Jetty is a New Jersey based clothing company that is making great efforts to help raise money to rebuild the shore towns New Jersey residents have loved for so long. I understand if people may not want to help for this particular cause, but regardless of who you are, everyone has something they care about. I challenge you to donate anything: time, money, clothing, food, to a cause that you believe in. There are people out there who need your help. What are you waiting for? Go HERE and donate!! !